Underfloor heating provides the greatest living comfort with even heating over your entire floor area. It is especially popular in washrooms, showers, bathrooms and storage rooms where stand-alone panel heaters can be difficult to place. Underfloor heating must be permanently installed by a professional technician. Installation is possible in both new buildings and renovations. When a floor’s surface temperature is a couple of degrees higher than the room temperature, it is usually thought very comfortable. 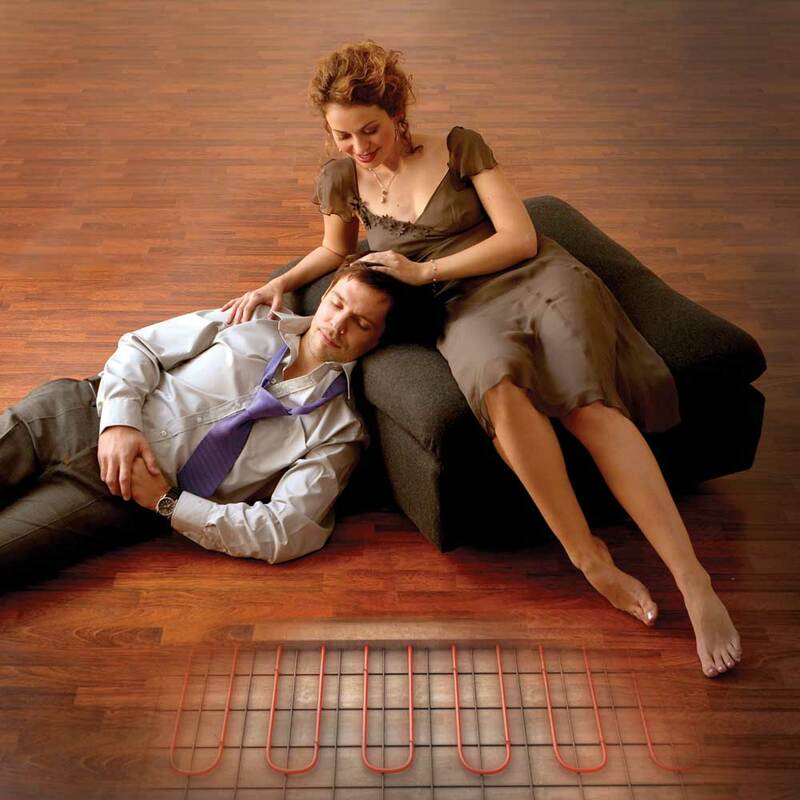 By combining floor heating with electric heaters, you can implement a heating system with which the floor surface can be constantly kept at around 23 to 24 °C during the entire heating period without risking too much heat transfer from the floor to the room during warmer weather. Underfloor heating is an efficient way of removing the cold feel of a stone or ceramic tile floor in winter. Floor heating is adjusted using room-specific thermostats. A floor thermostat with a sensor installed in the floor adjusts the floor temperature, preventing it from rising too high. The room temperature will change according to heating requirements. In living spaces, accuracy of adjustment can be improved using room thermostats or combined room and floor thermostats. The floor thermostat will limit the maximum temperature of the floor, while the room thermostat prevents the air temperature from rising too high. Through the correct use of thermostats it is unnecessary to switch the heating system off and on when the outdoor temperature temporarily becomes warmer or colder. The properties of the heating system depend on installation depth, floor surface material and the installation spacing of the heating cable. The most common installation location for heating cables is a base floor with a concrete structure, usually resting on the ground, but the structure may also be a concrete or hollow-core intermediate floor. Heating cables can also be installed in floors with a wooden (ventilated base floor) or gypsum board structure. We provide the full range of Ensto Underfloor Heating Products. Please see the Ensto website for more information.